Saturday, August 11, 2007 in Ames, Iowa. 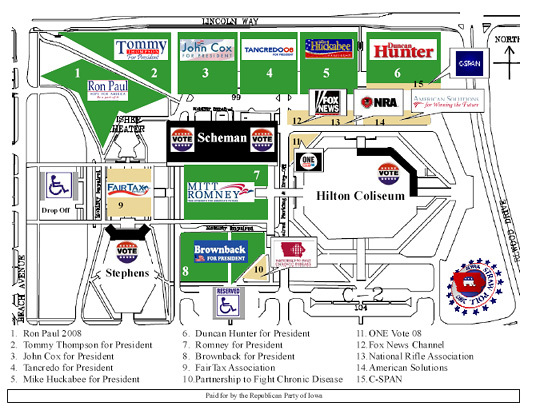 On Saturday, August 11, 2007 tens of thousands of Republicans from around Iowa traveled by bus and car to Ames, about half an hour north of Des Moines, for Republican Party of Iowa's Straw Poll, an important test of organizational strength. All told 26,000 tickets were sold at $35 each, and an estimated 33,000 people attended. The campaigns worked for months to prepare for the event. They organized buses and carpools to bring all their supporters in. Campaigns bought blocks of tickets, and offered incentives to attract people. > And, they arranged food and entertainment to keep participants happy. 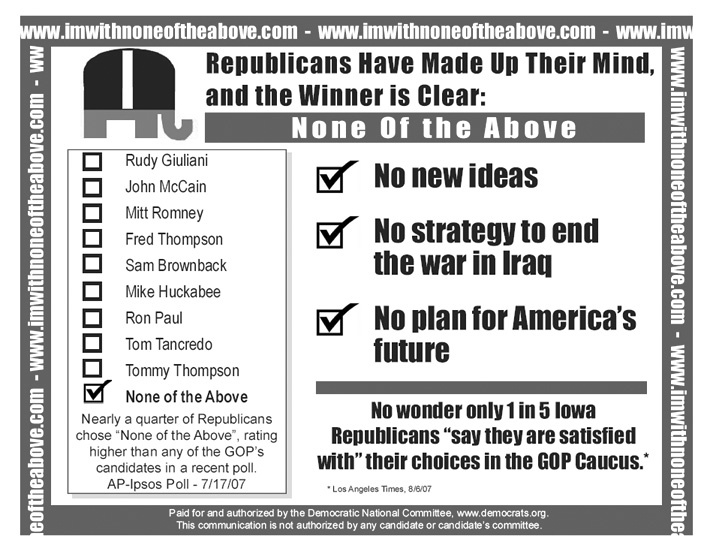 The candidates made speeches, and there was the much-watched Straw Poll vote, open only to Iowans. The Republican party credentialed 453 media representing 176 outlets, including 28 international outlets. By late Spring 2007 it was apparent that the campaign of former Gov. Mitt Romney was making an all-out effort to carry the Straw Poll. On June 6 the campaign of former New York City Mayor Rudy Giuliani announced it would not participate in the Straw Poll. Within a few hours, the campaign of Sen. John McCain announced that it too would not participate in the Straw Poll. The absence of several leading candidates diminished the luster of the Straw Poll somewhat, but the outcome still had consequences for the Republican field. Eight candidates participated--Sen. Sam Brownback, John Cox, former Gov. Mike Huckabee, Congressman Duncan Hunter, Congressman Ron Paul, former Gov. Mitt Romney, Congressman Tom Tancredo and former Gov. Tommy Thompson. The names of Giuliani and McCain were on the Straw Poll ballot as was the name of former Sen. Fred Thompson, a leading prospect who is still testing the waters. A number of interest groups were on hand. Former Speaker Newt Gingrich, who is seen as a possible candidate but has said he will not announce his intentions until late September at the earliest, represented his American Solutions organization. Other interest groups participating included Americans for Fair Taxation, the National Rifle Association, ONE Vote '08 and the Partnership to Fight Chronic Disease. Expectations were very much in play. Romney, as a "top tier" candidate had much at stake, and while he made some efforts to lower expectations, they remained high. For the "second tier" candidates a better than expected showing in the Straw Poll Would provide a significant boost, while a poorer than expected showing could cripple or even end one or two candidacies. When the vote totals were finally announced Romney had prevailed but with a somewhat smaller share of the votes than anticipated. Huckabee finished a surprising second. The 14,302 votes cast were significantly fewer than anticipated. June 22, 2007 Report - Allotting the lots. Tickets for the Straw Poll cost $35. See also: Lisa Rossi. "Thompson's aides scrap Ames street dance." Des Moines Register. July 26, 2007. July 26, 2007 - Romney Flips Again! How Important Is the Straw Poll?